Oops - we don't appear to have a video for the PS410. Excellent equipment to preserve old memories. Unfortunately I got off to a bad start with this scanner and the first one delivered refused to feed the Photos through. However an email to Tradescanners closely followed by a call from Kodak resulted in a new scanner delivered a couple of days later. After several weeks use the scanner is producing amazing results. The scanner is very fast and at 300dpi we managed to scan 250 7x5 photos in 20min (taking into account they were in envelopes and needed to be counted) The software included is excellent and includes automatic rotation although if colour corrections are needed a separate program e.g. Photoshop gives better results but the included software is ok. The scanner has 3 resolutions. 300dpi produces from a 6x4 approx file of 10mb, 600dpi 36mb and 1200dpi produces a massive 130mb. There are 3 sharpening levels but we tend to turn this off. Overall easy to use and very happy to give it a 5 star rating (although bit worried about the feed systems longevity after the first scanner). Now you can help customers transform a lifetime of memories so they can be easily shared, preserved, printed and displayed in exciting ways. 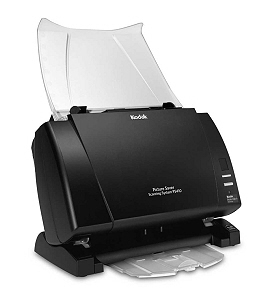 The KODAK Picture Saver Scanning System instantly creates a high-value new market and revenue stream for your business: helping people turn hundreds, even thousands of their pictures, postcards and other memorabilia into digital files. It's easy: consumers bring in their memories, you quickly and safely scan them, restore and enhance image quality, and return digital images on DVDs, portable USB drives, CDs and even KODAK Picture CDs. Plus, you can promote an array of photo specialty products created from their new digital files. Create a new revenue stream that goes beyond supplying digital images on DVDs, CDs or portable USB drives. Now you can also promote and sell a range of photo-centric keepsakes and gift items, including photo books, scrapbooks, frames, tributes, T-shirts, multimedia creations, calendars, mugs, mouse pads and much more.